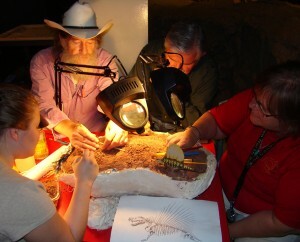 Today’s update comes David Temple – our associate curator of paleontology and a one of our BEYONDbones bloggers. They’re wrapping up the dig, and he fills us in on the progress from yesterday, as well as what’s in store for the team today. They’ll finish jacketing and removing as many fossils as they can from the site, and prepare what’s left to be sheltered until they return. They face two challenges: limited time and a paleontologist’s worst nightmare: rain. Hello my name is Holly, Im doing an assignment at school about excavation (2005-2009) i was just wondering why did you want to be a paleontologists?, how did your group indentify the site for the dig?, did you find anything? and what was the name o the dinosaur found? I will send your questions to our paleontologists and post their answers for you here. Thanks for reading – and good luck with your project! I haven’t received the answers back yet; I’ll post them here in case any other readers are interested, but I can e-mail them to you as well. why do the paleontologest use the tools that they use? what is a location of a dig?